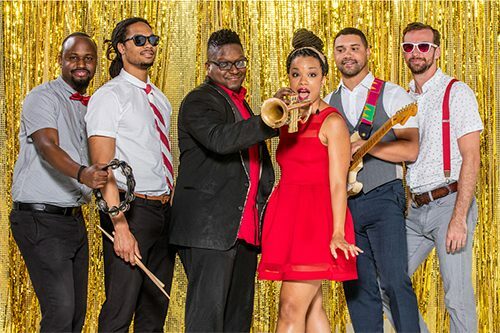 Hailing from Richmond, VA, Dance Candy is a party band that mixes the best of modern, popular hits of today with all the funky, soulful classics of the 60s, 70s, 80s and 90s. This all-star lineup features a soulful, sensuous female voice that draws influences from everyone like pop stars Adele and Whitney Houston to R&B greats like Jill Scott and Sharon Jones. The deep groove rhythm section can set the tone for everything from funk, rock and hip-hop. The sophisticated, funky lead guitar sets up the soaring melodies of the trumpet that leaves jaws dropped, and sometimes even hearts broken. Dance Candy is a tight six-pack of musicianship, schooled in the vibrant VCU music scene in Richmond. Heart and soul. Everything you need to party…and the night of your life.